…After reading the UN pact, I’m beginning to realize that Trudeau’s ill-considered “Welcome to Canada” tweet to the world was likely deliberate, as well as the language he uses to normalize illegal crossings. The pact seeks to make migration — for any reason — a recognized right. As for the rights of the receiving nation to object to having their borders overrun? Well, now you’re just being racist. I wish them well but hold little hope that the Liberals will be persuaded to refrain from signing the pact and really it is among the least of our worries, the rot is already too deep. Immigration is the 3rd rail in Canadian politics. 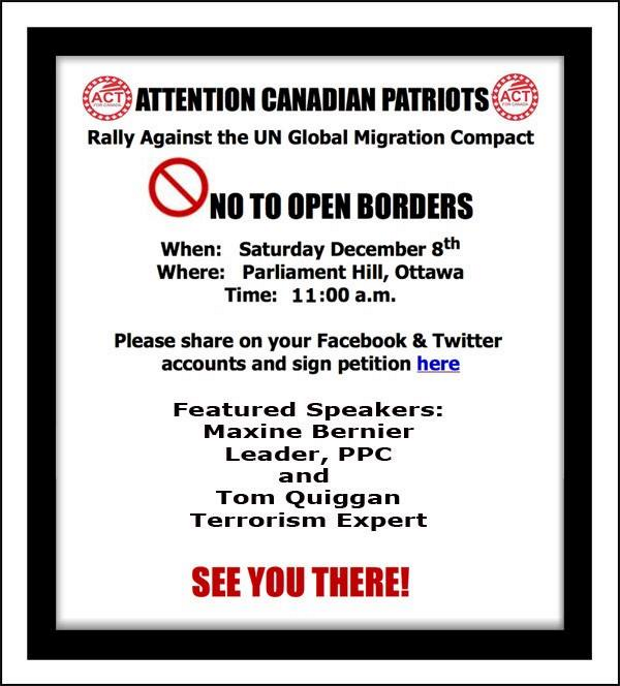 Canadians are afraid to speak “unpopular” opinions about immigration policy knowing they will be bludgeoned as racist by the government and their media lackeys. Our mainstream political parties are terminally corrupted by their pursuit of ethnic vote blocs, not one can be trusted. This divide and conquer splintering of the electorate has been made possible by the toxic lies of diversity and multiculturalism. The result is Canada has been turned into a mass immigration Ponzi Scheme that benefits the corporate and political class, your fate is mere collateral damage. When Canada is ruined and gone where will our mass immigration globalists emigrate to?